Meredith and I explored the Cimetiere du Montparnasse. I wanted to find the graves of Guy de Maupassant, Charles Baudelaire, and Man Ray. 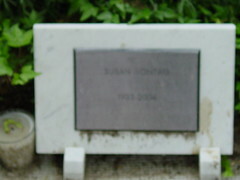 Instead we found the graves of Marguerite Duras, Bressai, Tristan Tzara, Jean-Paul Sartre, Simone de Beauvoir, and yes . . . Susan Sontag. Her grave, since it's new, was covered in flowers.